Children with Down syndrome can experience speech delay, due to hearing problems, low muscle tone and learning ability. Language is vital for a child’s cognitive (mental) and social development. As children acquire language, they can ask for what they want, explain how they feel, describe what they have been doing and share thoughts and worries with friends. 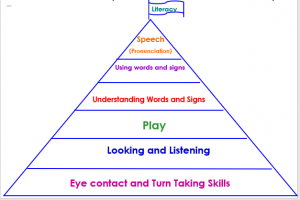 A Speech and Language Therapist works with children who have articulation delays and disorders. The therapist will evaluate each client to determine strengths and weakness, address family concerns and develop an individualised treatment plan appropriate to areas and level of difficulty. Please click on the links above for more information about the Speech & Language Therapy services that Aoife and Grainne provide and to book your child’s place.